La avantaĝoj de Popolunuiĝo - Esperanto from Parolu Mondo on Vimeo. 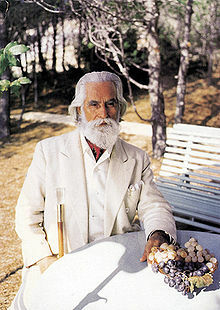 Omraam Mikhaël Aïvanhov (1900, Srpci, Macedonia - 1986, Fréjus, France) was a Macedonian philosopher, pedagogue, alchemist, mystic, magus and astrologer. He was a disciple of Peter Deunov (Beinsa Douno), the founder of the Universal White Brotherhood. complete works) are based on his lectures, which were recorded either in shorthand or on audio/video tape. They are published by Prosveta. Aivanhov’s philosophy teaches that everybody, regardless of race, religion, social position, intellectual ability or material means, is able to take part in the realization of a new period of brotherhood and peace on earth. This happens through the individual's personal transformation: growth in perfection and in harmony with the divine world. Whatever the topic, he invariably focuses on how one can better conduct life on earth. Aivanhov taught that to achieve a better life, one must have a high ideal. "... if you have a High Ideal. such as the bringing of the Kingdom of God on earth you obtain everything you wished for, you taste plenitude." and microcosm, and the exchanges that constantly take place between them. This knowledge has taken different forms throughout the centuries. It is the "perennial wisdom" expressed through various religions, each adapted to the spirit of a particular time, people, and level of spiritual evolution. Aivanhov's teaching incorporates aspects of Esoteric Christianity that relate to finding the "Kingdom of God on earth" within the individual. One of the essential truths of initiatic science, according to Aivanhov, is that (in the higher world) all things are linked. Thus committing oneself to the Kingdom of God on earth makes it realizable: "The real science is to form within ourselves, in the depths of our being, this Body that Initiates call the Body of Glory, the Body of Light, the Body of Christ."